Prepare to enrich your palate and rejoice in history, nature, and culture as you discover one of the most interesting areas of Europe! 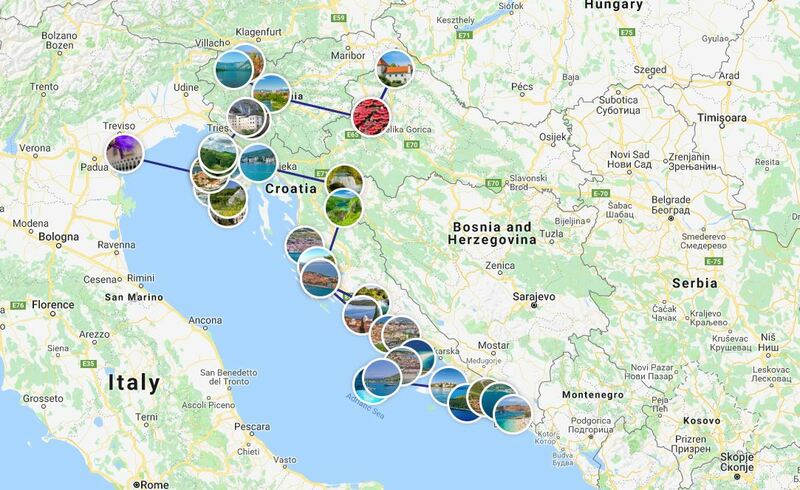 Spend 14 remarkable days touring Croatia, Slovenia and a touch of Italy, followed by 8 days onboard a Deluxe Small Ship, cruising the gorgeous Adriatic coastline. You may even choose to extend your stay to see Montenegro and Bosnia & Herzegovina. History & Culture: Throughout our tour we will be joined by local guides who will intrigue us with their tales of local history and culture. 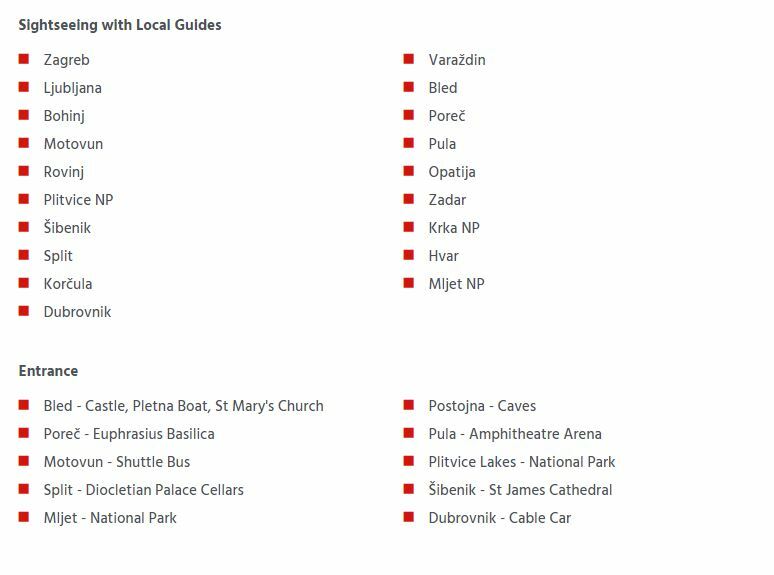 Together we will visit six of Croatia’s eight UNESCO World Heritage Sites. Landscapes & Nature: Imagine impressive mountain ranges, breathtaking National Parks, and the crystal clear Adriatic Sea. Cuisine: Experience the traditional flavours and cuisines of each area we visit, whether dining in a local restaurant for lunch or dinner, or enjoying a special tasting. MS Markan (2018): Capacity 38 passengers, A/C, 9 VIP Upper Deck Cabins with Private Balconies, 2 Main & 8 Lower Deck Cabins with ensuites, length 48.5m, width 8.8m, 220V, restaurant, bar, lounge, SAT TV, covered terrace, sun deck, jacuzzi, swimming platform. MS Black Swan (2018): Capacity 36 passengers, A/C, 3 VIP Cabins (2 Upper, 1 Main), 5 Main & 8 Lower Deck Cabins with ensuites, length 48.4m, width 8.6m, 220V, restaurant, bar, lounge, SAT TV, covered terrace, sun deck, jacuzzi, swimming platform. Having guided tours across Europe before making New Zealand her home, Ela is again looking forward to sharing her passion of great food, culture, and history with you all on this marvellous tour. 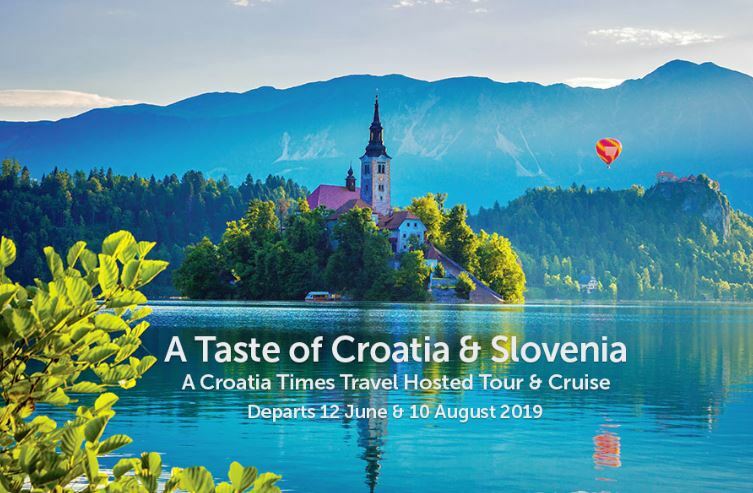 Passionate about travel and her Croatian heritage, Teodora has previously hosted tours and is excited to showcase the very best of Croatia and Slovenia once again. Join her on this delightful tour. Enjoy a day trip to Venice. A walking tour will show you the highlights, including St Mark’s Square, St Mark’s Basilica, the Doge’s Palace, Bell Tower and Bridge of Sighs. Visit a glass blowing factory and watch a master artisan demonstrate this traditional Venetian art. The rest of your day is at leisure to experience Venice. Late afternoon return to Poreč for dinner and overnight. Cruise towards Korčula the birthplace of Marco Polo. Lunch is in a secluded bay enroute. Afternoon arrival followed by a guided walking tour of this enchanting medieval coastal town. A fish bone street pattern design was used in Korčula Old Town to reduce effects of wind and sun and provide citizens with sheltered and comfortable accommodation. There are many wonderful restaurants to choose as well as bars and clubs for those looking for evening entertainment. 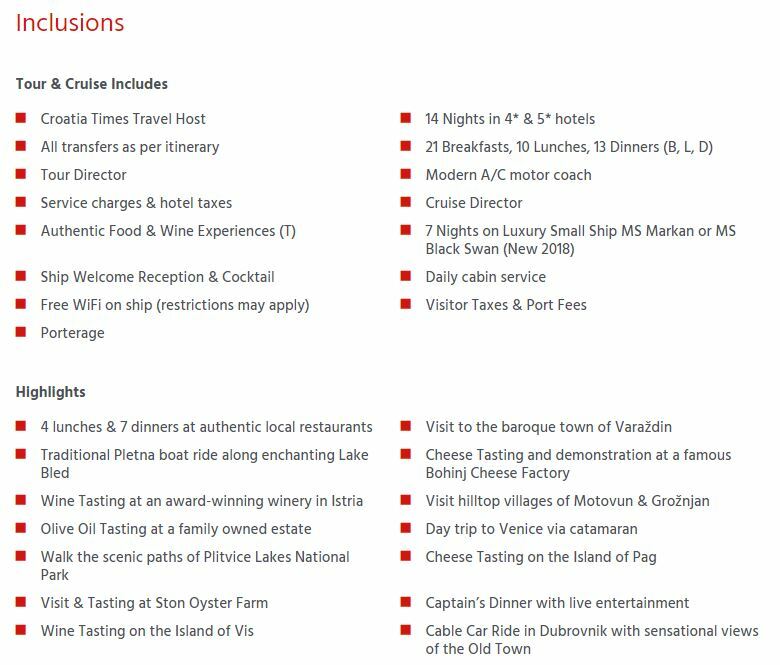 Optional excursion to small village near Korčula for real local experience where you will enjoy dinner and hear about history and local life. ​VIP Cabins are on the Main or Upper Deck. Upper Deck Cabins are above the Main Deck. Lower Deck Cabins are in the hull of the ship, below the Main Deck. All cabins are allocated according to availability. Most port arrivals are in the late afternoon. Cruising time is approximately 4-5 hours a day. Guests are obliged to follow ship rules. Due to specific mooring conditions and requirements in some Croatian Ports, ships are moored side by side. This makes it necessary to cross from one ship to the other where there are gaps in between each ship. Special care must be taken at all times when crossing between the vessels and guests do this at their own risk. Crew assistance will be given to those needing and requesting it. Cruises are not recommended for those in wheelchairs or with limited mobility. Deposits: Upon confirmation a non-refundable deposit of $1,500 per person is payable. Final Payment: Final payment is due no later than 60 days prior to departure from New Zealand. Prices: All prices are in NZ$ based on twin share per person. Airfares and any costs not stated are not included. Solo Travellers: To guarantee a private room, solo travellers must book the ‘single use’ price. If you agree to share with another passenger of the same gender you will pay only the ‘twin share’ price. Group Size: Tour & Cruise – up to 25. Cruise only – up to 36/38. Tour Arrangements: We reserve the right to alter the routing, change accommodation and services if required. The cruise operator reserves the right to alter the route due to weather or other conditions and cancel or change the ship if necessary. Travel Insurance: It is a requirement of this travel arrangement that all travellers must take out a fully comprehensive travel insurance for the full duration of this trip. Contact us for more information and full booking terms & conditions. Insurance is required for this tour. We’ll be happy to provide a quote or you’ll need evidence of your own insurance.